In this special anniversary year at the Museum Ludwig, the exhibition Fernand Léger: Painting in Space casts a new light on one of the most diverse and influential artists of modernism. For the director of the Museum Ludwig, Yilmaz Dziewior, Painting is Space fits so poignantly in the 40th anniversary year of the museum, not only because it is the first retrospective that focuses on the Fernand Léger’s murals but also because it takes Les Plongeurs (The Divers, 1942) as the point of departure for the exhibition. 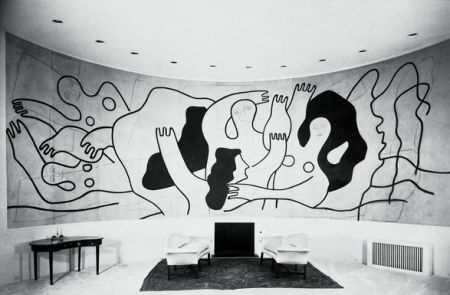 Léger painted this mural for the home of the New York architect Wallace K. Harrison. Les Plongeurs was then acquired 30 years ago by Peter and Irene Ludwig especially for the new Museum Ludwig building, which opened in 1986. Since then, the mural has been part of the museum’s collection. As an architectural draftsman by training, engaging with built spaces through painting was a major concern for Léger. His quest to extend painting beyond the limits of the easel and integrate it within social space and architecture is illustrated by a number of projects both realized and unrealized. Léger (1881–1955) developed close ties to key figures in modern architecture such as Robert Mallet-Stevens, Le Corbusier, Charlotte Perriand, Wallace K. Harrison, Paul Nelson, André Bruyère, and Carlos Raul Villanueva. Proclaiming himself the architects’ ideal artistic partner and closest ally, he encouraged them to solicit him to collaborate on their projects by bringing color and life to their white, neutral walls. In this way, he sought to successfully integrate modern architecture into everyday life and generally improve human lives through the social and psychological impact of color. Fernand Léger: Painting in Space explores the fruits of this dialogue and traces the painter’s development from the early 1920s until his death in 1955. The exhibition reevaluates his painting in the context of architecture and everyday life. Visitors can discover the fascinating and diverse types and levels of collaboration between the painter and architects. The exhibition highlights Léger’s pioneering temporary and permanent painterly interventions for the public and private sphere, including houses, apartments, churches, a ship, public buildings, and world’s fairs. It also features unrealized, lesser-known, experimental projects and studies that Léger worked on with his architect friends. For the first time, individual projects and murals will be presented alongside related paintings, drawings, designs, and preliminary studies. Archival and source materials such as photographs, correspondence, and publications illustrate the historical context. The exhibition brings together a selection of Léger’s most important surviving large-scale murals, which are only rarely shown or have seldom left their original location, such as Le Transport des Forces, which Léger created for the Palais de la Découverte on the occasion of the 1937 World’s Fair, another monumental mural that Léger realized at the invitation of Charlotte Perriand for the Triennale di Milano in 1951, as well as an abstract mural that Léger conceived for the cruise ship Lucania in 1953. In addition to its focus on the murals, the exhibition also includes selected early works by Léger in the fields of experimental film, graphic design, theater set and costume design, as well as carpet designs. These projects place Léger’s murals within a larger context and demonstrate how he constantly strove to bring painting beyond the canvas and into the room and everyday life. For the first time, the exhibition brings together some 170 works as well as related archival materials, with important loans from major European and American collections. A catalogue will be published in German and English by Hirmer, with 312 pages, including some 350 illustrations and a dozen essays by international specialists, as well as extensive, in some cases previously unpublished archival materials and primary texts. Image: Les Plongeurs in the living room of Wallace K. Harrison. Installation view. Courtesy of Galerie Gmurzynska. © VG Bild-Kunst, Bonn 2016.